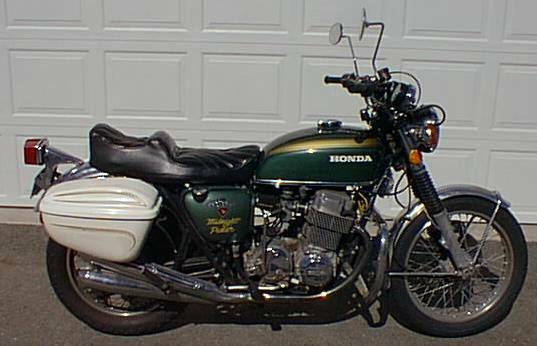 This is a 1976 Honda CB750K6. The bodywork and those fantastic saddlebags are from a 1971 model. The bike has individual K&N's and Accel coils. This is the machine that gets me to work and back, nearly every day. The wiring is a little flakey (as I found the other night when all the lights went out during a thunderstorm), but it always starts up. It is the ancestor to every superbike on the road today. Hard to believe, because it handles like a truck, has no ground clearance and stops about as fast as a '77 Cadilliac.